I'd like to interrupt our regular programming (haha…) to talk a bit about the Relay for Life. 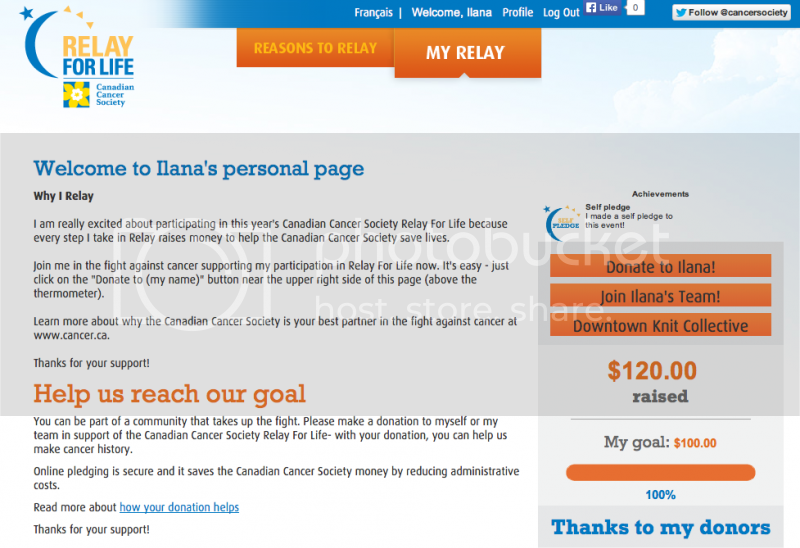 The Relay is a 12-hour overnight fundraising event for the Canadian Cancer Society. Teams come together at a park with a track, and one member of the team will walk the track for a while until another member of the team takes over. It is supposed to symbolize and honour a cancer patient's journey, ending with the hope of the sunrise. I'll be participating this year with the Downtown Knit Collective team. All night, we'll be knitting charity items, and also providing the rest of the event with knitting, crochet, and other crafty lessons. In addition, we'll be selling small yarn-crafted items at the event… which reminds me, I'd better get on crocheting a few flower pins! Also, our team is currently in third place for fundraising! And that brings me to the fundraising bit. I'm sure all of you reading this have been touched by cancer in some way. Myself, I've been lucky enough not to have lost anyone really close to me to the disease, but I have still known a few who have fought to survive it. More than one of my university profs has passed away after a fight with cancer, and just recently, my aunt had to go through a double mastectomy and chemotherapy when she was diagnosed with breast cancer. Even the smallest amount can help move us further towards a cure, so please consider pledging a small amount on my behalf. Donations of $10 or more are tax deductible. You can donate by clicking here or by clicking on the image below. I'll be grateful for any donations, large or small! Thank you all in advance!